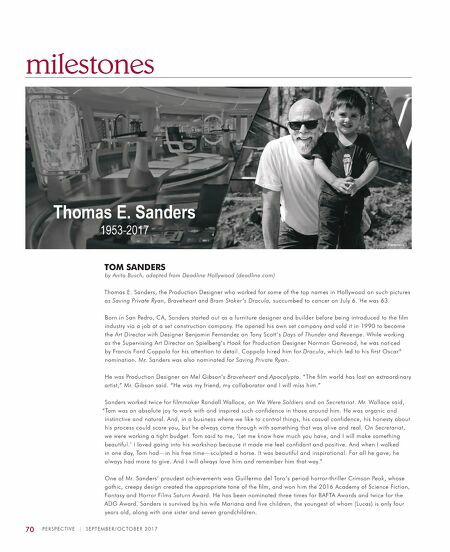 70 P E R S P E C T I V E | S E P T E M B E R / O C TO B E R 2 0 1 7 milestones TOM SANDERS by Anita Busch, adapted from Deadline Hollywood (deadline.com) Thomas E. Sanders, the Production Designer who worked for some of the top names in Hollywood on such pictures as Saving Private Ryan, Braveheart and Bram Stoker's Dracula, succumbed to cancer on July 6. He was 63. Born in San Pedro, CA, Sanders started out as a furniture designer and builder before being introduced to the film industry via a job at a set construction company. He opened his own set company and sold it in 1990 to become the Art Director with Designer Benjamin Fernandez on Tony Scott's Days of Thunder and Revenge. While working as the Supervising Art Director on Spielberg's Hook for Production Designer Norman Garwood, he was noticed by Francis Ford Coppola for his attention to detail. Coppola hired him for Dracula, which led to his first Oscar ® nomination. Mr. Sanders was also nominated for Saving Private Ryan. He was Production Designer on Mel Gibson's Braveheart and Apocalypto. "The film world has lost an extraordinary artist," Mr. Gibson said. "He was my friend, my collaborator and I will miss him." Sanders worked twice for filmmaker Randall Wallace, on We Were Soldiers and on Secretariat. Mr. Wallace said, "Tom was an absolute joy to work with and inspired such confidence in those around him. He was organic and instinctive and natural. And, in a business where we like to control things, his casual confidence, his honesty about his process could scare you, but he always came through with something that was alive and real. On Secretariat, we were working a tight budget. Tom said to me, 'Let me know how much you have, and I will make something beautiful.' 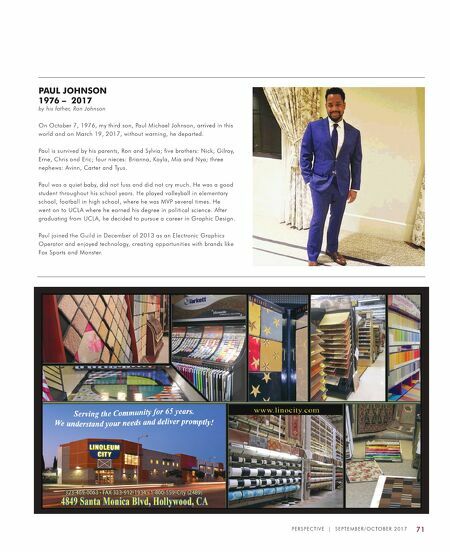 I loved going into his workshop because it made me feel confidant and positive. And when I walked in one day, Tom had—in his free time—sculpted a horse. It was beautiful and inspirational. For all he gave, he always had more to give. And I will always love him and remember him that way." One of Mr. Sanders' proudest achievements was Guillermo del Toro's period horror-thriller Crimson Peak, whose gothic, creepy design created the appropriate tone of the film, and won him the 2016 Academy of Science Fiction, Fantasy and Horror Films Saturn Award. He has been nominated three times for BAFTA Awards and twice for the ADG Award. Sanders is survived by his wife Mariana and five children, the youngest of whom (Lucas) is only four years old, along with one sister and seven grandchildren.